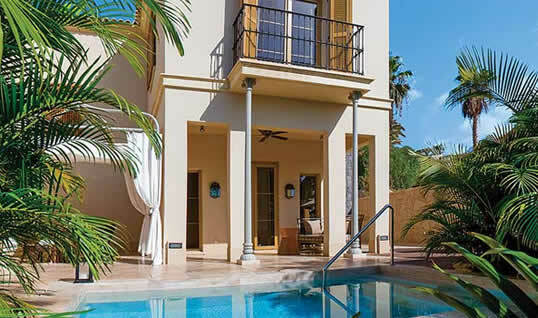 Want a villa holiday with hotel facilities? Look no further! Our Holiday Resorts offer a village-style setting with a welcoming community vibe and a relaxed, carefree ambience. With a wealth of leisure facilities at your fingertips, Holiday Resorts are perfect for keeping the whole family entertained, while enjoying the freedom and privacy of a villa-style holiday. Accommodation options on our Holiday Resorts offer a range of choices to suit everyone, with apartments, townhouses and villas on-site. While we still have these properties in our Villa Collections, sometimes the facilities will be available in the resort rather than at the property, for example a communal pool or laundry facilities. Each villa description will have the specifics, but rest assured they still fit the James standard with a load of fun to boot. Make the most of villa living with a private pool, while being in a community setting. Close to all the action, our villas on Holiday Resorts are just a stone's throw away from facilities. So, you are free to return from a busy, fun-filled day to your private and spacious home from home. Many of our Holiday Resorts offer a selection of well-equipped holiday apartments, residences and suites. Spacious and comfortable, apartments are a fantastic, hassle-free option for your self-catering holiday. Located close to the resort's amenities, our townhouses are ideal for families or groups of friends. Split over two or more floors, these properties provide ample space and privacy. A shared pool and garden area are right outside - a unique opportunity to enjoy the seclusion of a self-catering property alongside the facilities of a hotel. Not one to stay on the sunlounger on holiday? Or perhaps a mixture of lounging and fun-filled activities is more your thing? With a wealth of leisure facilities at your fingertips, it's easy to entertain the kids, get active or take up a new hobby at a Holiday Resort. Kids' clubs, communal pools and on-site beaches are great places to make friends, while mum and dad can join in the fun, or enjoy some timeout at the golf course or spa. The next Messi or Ronaldo? Budding football stars - several of our Holiday Resorts feature top notch soccer schools! Action packed and great fun, boys and girls of all ages can up their game with professionally run programmes. The next Murray or Djokovic? Take advantage of beautifully maintained tennis courts at your Holiday Resort. Knock-about with a friendly family game, or brush up your skills with professional coaching. Doubles, anyone? Don’t want to cook every night, or at all? With on-site restaurants, our Holiday Resorts can cater for every taste during your holiday. Do you enjoy a round or two? Whether your swing needs improvement, or you're king of the course, it's easy to lose a few hours on our Holiday Resorts' fantastic golf courses. World class spas on-site mean you can take a leisurely stroll from your villa for a day of pampering, relaxation and treatments. Many of our Holidays Resorts are situated on the beach, so grab your bucket and spade. Sand and surf are right on your doorstep. * Facilities will vary from resort to resort and will be clearly stated on the specific resort page of the website. For a refreshing dip or hours of fun in the water, head to our Holiday Resorts' swimming pools. There's at least one large, shared pool at each Holiday Resort, and many have more than one to choose from! So pull up a sunlounger and order that drink. So you've decided a Holiday Resort is for you! Explore our extra special offers and you'll be on the way to a Holiday Resort stay with us. From early bird promotions to discounts, be sure to check out the latest offers before booking. Book your holiday to Sun Gardens Dubrovnik resort and save up to 20% on your accommodation for selected dates. Book your holiday to Pine Cliffs Resort and receive up to 25% off on selected dates and accommodation. Don't miss out on your chance to enjoy this fantastic resort has to offer, hurry offer ends soon! Book your holiday to Pine Cliffs Resort and receive up to 25% off of their beautiful variety of villas for selected dates. Don't miss out on your chance to enjoy this fantastic resort has to offer, hurry offer ends soon! Book your holiday to the fantastic Bougainvillea Barbados Resort during and receive 20% off your stay! Book your holiday to the fantastic Bougainvillea Barbados Resort during and receive 25% off your stay! Book your holiday to the fantastic Bougainvillea Barbados Resort during and receive 15% off your stay! Save up to 10% on stays between May and October at the Royal Gardens luxury resort. Early booking offer up to 15% off! Book your holiday to Monte Rei Golf & Country Club and receive up to 15% off selected dates! Don't miss out on your chance to enjoy what this fantastic resort has to offer! Enjoy a free welcome dinner when you book to stay at the famous Monte Rei Golf & Country Club. This luxury resort is offering a complimentary welcome dinner for selected villas, so why not make the most of this amazing offer and treat yourself! Welcome Dinner for 5 and 7 night stays. 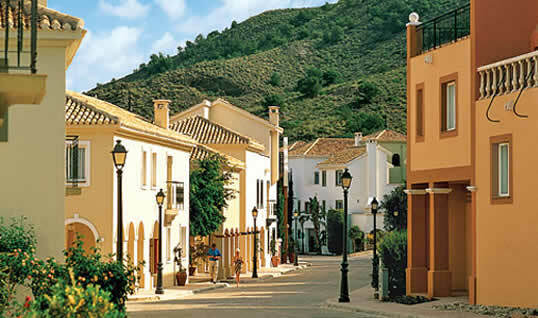 For reservations for Villa Rei 20, Villa Rei 21 and the Ad Hoc Detached Villa excluding Miradouro Villa I, II, III and Villa Rei 38. Excludes drinks. Save up to 10 % on stays between April 2019 and October 2019 at the Green Gardens Resort & Suites holiday resort. up to	15% off	2019! Up to 15% off 2019! Book your 2019 holiday to Aphrodite Hills and you could take advantage of up to 15% off the price of your accommodation. Don't miss out on your chance to enjoy the best this fantastic resort has to offer! Book your holiday to Domes Of Elounda and you could take advantage of up to 10% off the price of your accommodation. Don't miss out on your chance to enjoy the best this fantastic resort has to offer! Book your holiday to Domes Of Elounda and you could take advantage of up to 15% off the price of your accommodation. Don't miss out on your chance to enjoy the best this fantastic resort has to offer! Book your holiday to Domes Of Elounda and you could take advantage of up to 20% off the price of your accommodation. Don't miss out on your chance to enjoy the best this fantastic resort has to offer! Complimentary Dine Around at all four restaurants at Domes of Elounda with their free upgrade to Half-Board, applicable per person, per booking, throughout the year! Book your holiday to the fantastic Domes of Elounda Resort and take the opportunity of upgrading to full board with 50% off! Applicable per person, per booking, throughout the year! Children also get a free upgrade to full board with two paying full board adults! Early booking offer of up to 40% off! Enjoy the fabulous Vidamar Resort, indulge at the beautiful spa or let the kids explore and play in the fantastic kids club with an early booking offer of up to 40% off of selected dates in 2019. Book your holiday to one of our stunning properties at the Blue Waters Resort and receive up to 30% off your accommodation! Book your holiday to one of our stunning properties at the Blue Waters Resort and receive up to 40% off your accommodation! Book your holiday to one of our stunning properties at the Blue Waters Resort and receive up to 50% off your accommodation! Book your holiday to The Crane resort and receive up to 40% off your accommodation! Up to 25% discount for selected 2019 dates! 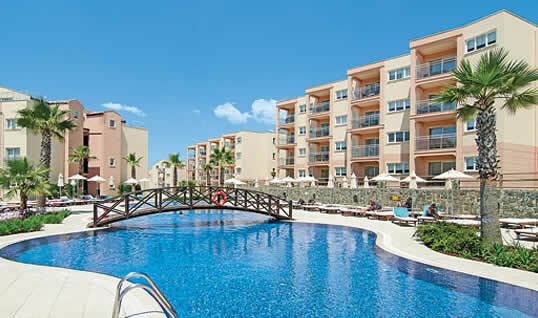 Book your holiday to Playitas Resort and take advantage of up to 25% off your accommodation! Book your 2019 holiday to the Half Moon Resort before 30th September 2019 and enjoy a complimentary round of golf per guest, per room! Book your 2019 holiday to the Half Moon Resort before 30th September 2019 and enjoy a complimentary spa treatment per guest, per room! Book your 2019 holiday to the Half Moon Resort before 30th September 2019 and enjoy a complimentary cocktail per night, per guest, at the resorts fantastic Cedar Bar! Offer valid for stays 60 days prior to departure. Book your holiday to Praia D'el Rey Resort and take advantage of discount of up to 35.% off your accommodation!